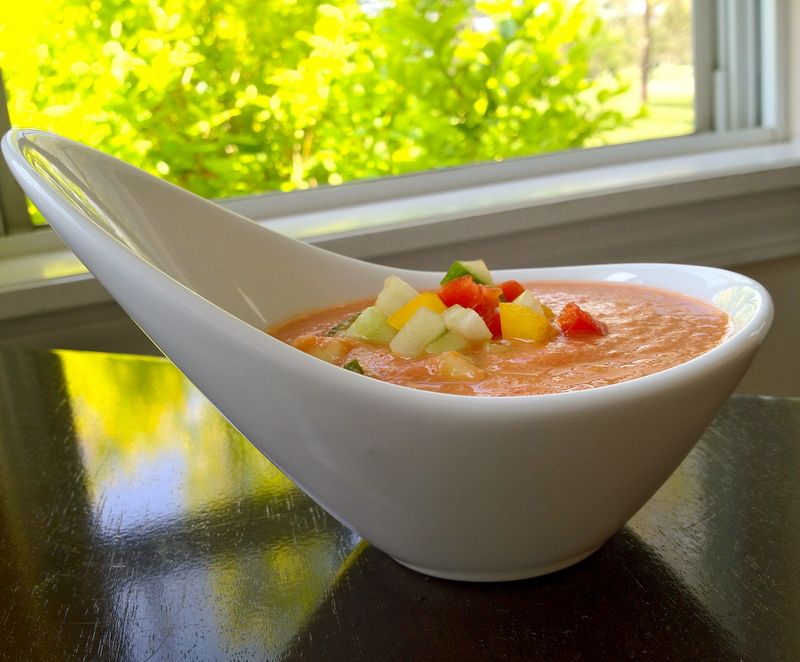 One of my favorite things to eat during the spring and summer months is a gazpacho. It’s so refreshing and light, and the fact that it’s served cold makes it not only low maintenance but perfect for those hot days! The great part about this soup is that I change the recipe as the vegetables at the farmer’s market change meaning that it always has the freshest ingredients possible. This recipe is a vegan one and makes about 8 cups… I usually make it for dinner one night (we eat it with a loaf of crusty french bread) and then eat the rest for lunch during the rest of the week! I like some texture in my gazpacho, so I dice up a small amount of the vegetables to add in once the rest is pureed. If you prefer just a smooth soup then you can skip this step and just put everything into the blender. Finely dice 3/4 english cucumber (I used what was left over from the scallop dish from the other night), 1/3 yellow bell pepper, 1/3 red bell pepper, and 1/4 large white onion. Set aside. 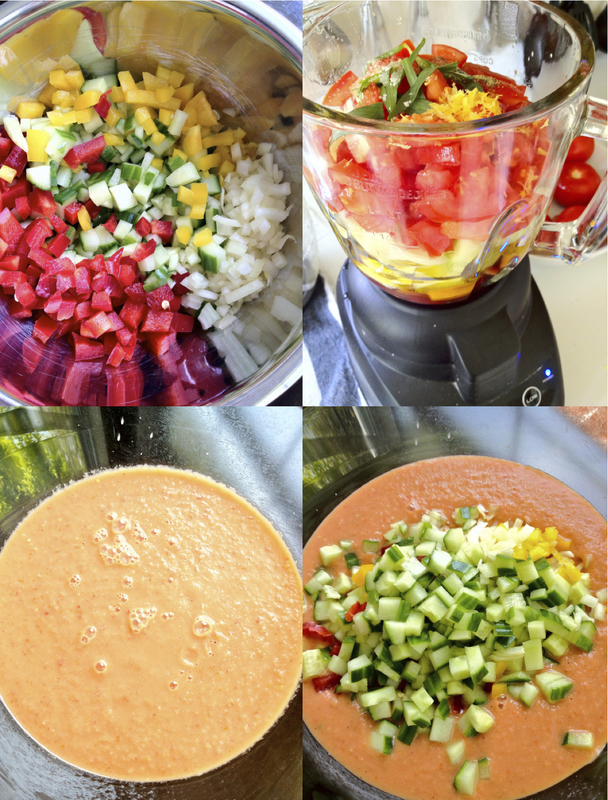 The rest of your vegetables will be added to your blender, just cut them into smaller chunks to help with the pureeing process: 3/4 yellow bell pepper, 3/4 red bell pepper, 2 peeled and seeded cucumbers , 3/4 white onion, 5 large tomatoes and 2 large cloves of garlic. Then add in 1/4 cup extra virgin olive oil, 1/2 cup water, 1/3 cup red wine vinegar, the zest and juice from half a lemon, a few tarragon leaves and a pinch of salt and pepper. Blend until completely smooth and then transfer to a large bowl. Stir in your diced vegetables. The most important step while making gazpacho is to let it rest in the refrigerator a minimum of 4 hours up to overnight before serving. The flavors need a chance to blend together and the olive oil and vinegar will work into the diced vegetables to enhance their flavor. Serve chilled in bowls, and garnish with some diced vegetables (if preferred). As I said before, this is just the recipe I used for this batch… it changes each time I make it depending on what they had at our farmer’s market. Play around with different peppers or cucumbers, add in less tomato and more of something else… the combinations truly are endless. Also, I add much less olive oil in my gazpacho then is normally added in an attempt to keep it lighter (that’s why I add the 1/2 cup of water) but you could swap out the water for more oil if you like. Delicious! I’m interested: English cucumber, as opposed to what? by the way, cool bowl. As opposed to regular slicer cucumbers…. English cucumbers are longer and more narrow so they have smaller seeds which means u don’t have to scoop them out and they also are wrapped in plastic so they don’t have waxy skin, therefor you generally don’t have to peel them either! – This looks wonderful. I also love roasted red peppers and feel it gives the food a different flair than the green pepper. I do use the green pepper but often find myself changing to a red pepper if a recipe calls for green. I also have a vegan blog. If you feel it is of interest could you please add me to your blog roll. Thank you. And I will be trying your soup.